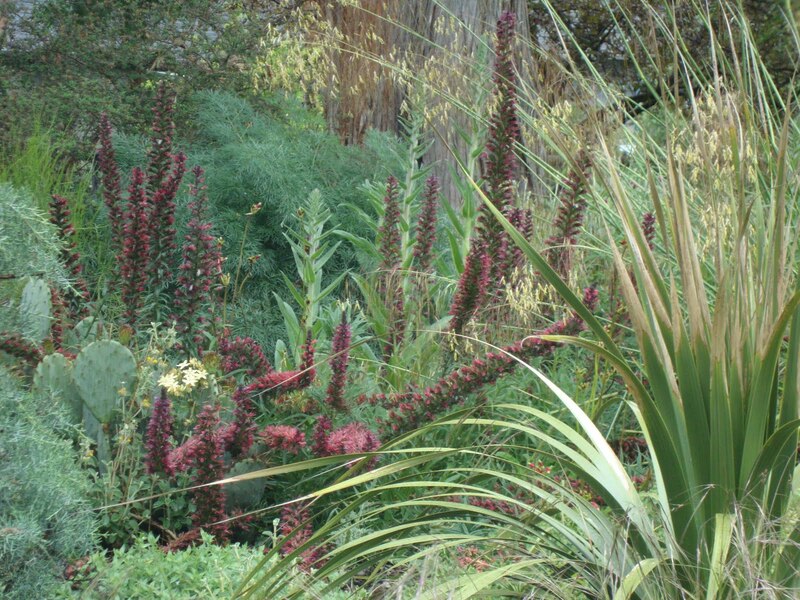 Another of my hopeless passions…Echium. 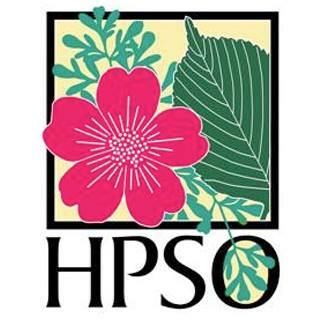 Hopeless because I live in Portland, Oregon, not Southern California. They are not a hardy lot, these Echium. But I love them so. This year’s collection numbers 7; a mix of good sized plants and little seedlings, seedlings that I am optimistically hoping will live through winter to see another sunny summer. 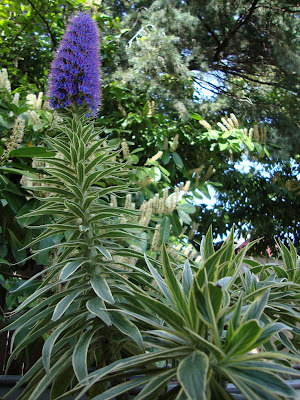 Last year, (the first year there was an Echium in my garden) there were only two. It’s a quickly growing addiction isn’t it? 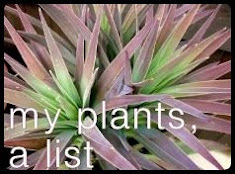 I’ve been collecting pictures of the Echium in my garden (and others) for 4 months now, thinking I would put together some fabulous and educational post. But I think I’ve taken so many pictures that it’s a bit overwhelming and I keep putting off actually doing it. It’s time to finally plunge in and make it happen. 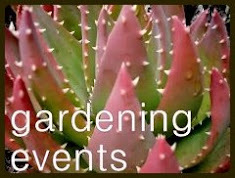 This isn’t the educational post I had envisioned but maybe a few pictures will be enough to push one or two of you into trying these fabulous plants in your garden. The first Echium purchase of the season was mail order from Annie’s Annuals. Two Echium fastuosum, “Pride of Madeira” both shown above shortly after planting in April. And then an early visit to Cistus Nursery set me up with another flashy variegated Echium, already with a bloom spike, which I am afraid is really the only way to see them bloom in our climate…unless you have a green house. 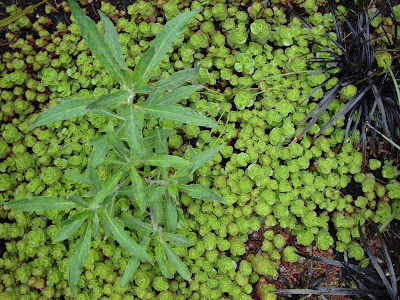 Shortly after that an Echium wildpretii joined the growing collection. Followed by two Echium x wildprettii 'Rocket' which for some reason I put in containers. 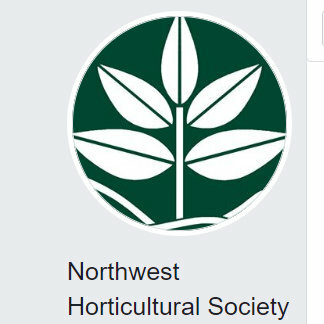 Maybe because I (surprisingly) had empty containers at the time and I was a little gun-shy about putting them in the ground since they are on the edge of being hardy here in Portland? Well it’s amazing to see how much they’ve all grown. 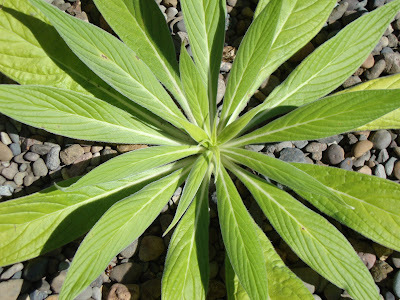 It makes it worth having these Echium and treating them as annuals here in Oregon. These next two are the ones from Annies, pictures taken August 18th. And the variegated one from Cistus, picture also taken Aug 18th. Last Friday I had the opportunity to see an Echium x wildprettii 'Rocket' that Patricia (one of my plant lust cohorts) had planted in the ground, rather than in a container. Lush don’t you think? I promptly went home and put one of my pair in the ground. Insurance you see. One in the ground, one in a pot. Hopefully one of them will make it through the winter. 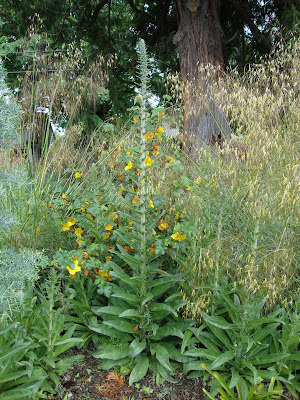 Besides watching my personal Echium collection I’ve also been keeping an eye on a couple growing at the neighborhood McMenamins restaurant, Kennedy School (more on the Kennedy School gardens tomorrow). These rasberry colored bloom spikes are E. boissieri I believe. And since I’ve watched these successfully overwinter I’ve collected seeds (with the gardeners blessing) and will try to propagate them. Cause I’m an Echium addict. Those are gorgeous...I have to admit, there are not many plants I regret we can't grow (can hardly complain about zone 8 when I grew up in zone 4)...but Echium is one of them! 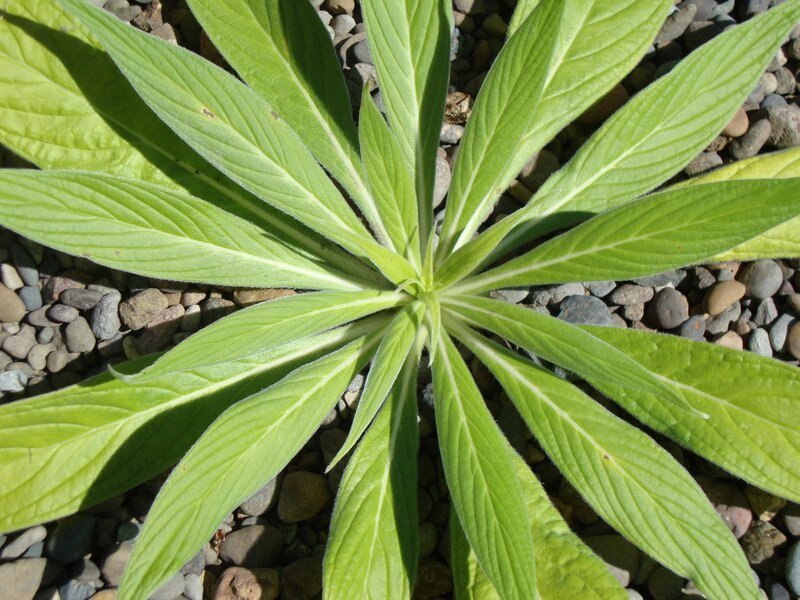 I've get the Echium bug as well,three this year. Umm...Annies Annuals, ,I'll have to dig out my copy. 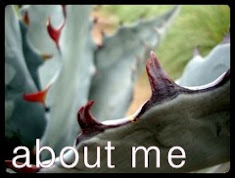 I was just out takes photos of my Echiums. Don't they look great at the moment? Yes, you're an echium fanatic. And that's not the only genus you obsess over, now is it? 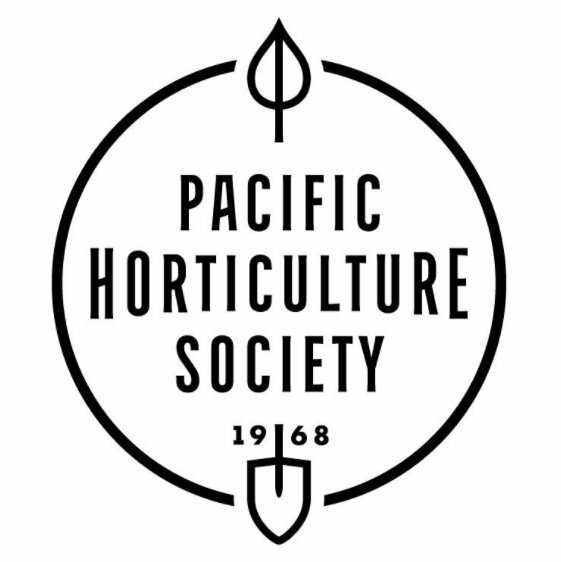 Just want to say I appreciate the permission-based way you get cuttings, paddles, seeds, etc. 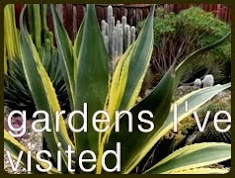 and investigate private gardens without trespassing. A surprising number of people are not that sensitive: some years back, we noticed two fellows in our back yard early on a Saturday morning. Seems they were interested in Mr. Mulchmaid's deck design and construction methods. But they just wandered into our private space and helped themselves to a gander and a discussion together. Back then, we didn't have a fence enclosing the back, but it would have been a lot nicer and more appropriate to ring our doorbell and ask to see it up close! Ahh Loree, I feel your pain. 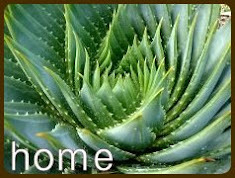 No Echiums here either, they are a coastal dweller. If I drive west for an hour or two , they are there in all their glory. Even though Sunset approves of some cultivars for my zone , I never see them here. Hmmm, maybe that's a challenge ? 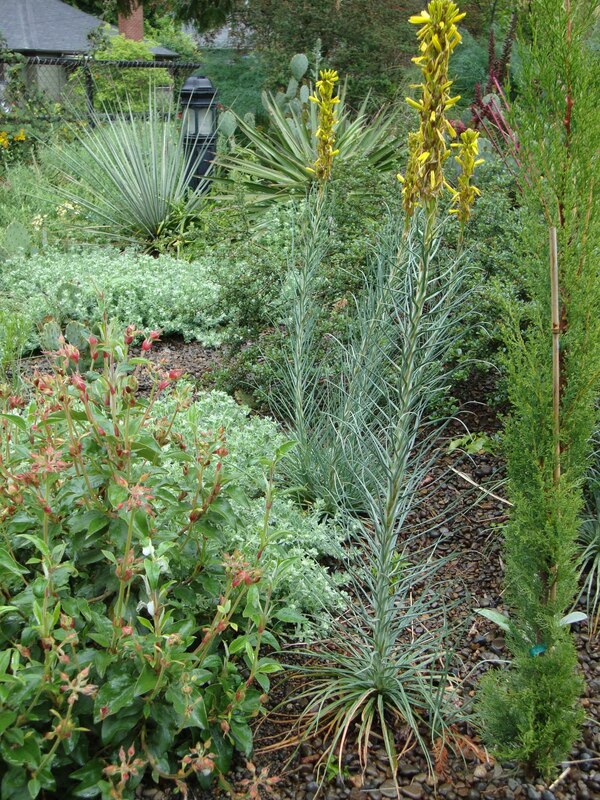 The echiums are pretty of course, but I really like your combo of chartreuse creeping jenny and black mondo grass! I just have the one E. gentianoides 'Tajinaste' from Annies. These get to be big boys down here. I must admit that variegated one is really tempting me. I almost put it in the spot I moved the dasylirion into recently. And that raspberry-colored one, wow! Looks like Lobelia tupa almost. Is that purple bloom with the variegated foliage in your garden? Spectacular! They would be well worth having for the foliage alone, but OH, those flowers. 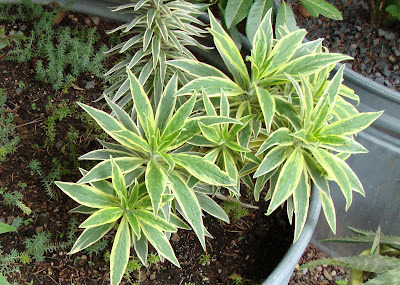 I like the variegated Echium. It really pops! Good idea to split the difference with one in a pot and the other in the ground. Nothing like a good trial :) Hopefully both will survive. Its a beautiful addiction! I grew Echium 'Rocket' in my garden 2 years ago. The top of the plant became so big, so quickly, that it toppled over and therefore had to be propped with a bamboo stake but I didn't mind. I don't think it would have toppled over had there been enough sun. 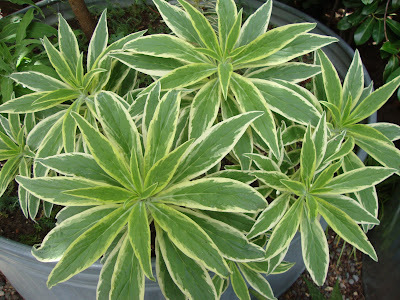 I'll definitely include Echium in my front southern exposed garden...when I have one, that is! scott, I know! I feel silly complaining too but when I see how beautiful they can be in San Francisco for example, well it just hurts. linda, Annies is great...they have several kinds too, next year I will be ordering more! MulchMaid, I have no idea what you're talking about!!! (ok, you know me too well). Seriously!? They were in your backyard? That is just so wrong. When I was taking pictures of the plums last week I really wanted to step around to the other side of the tree, I could see the perfect shot there. But then I would have been seriously trespassing. So I didn't, I try to be good. ks, a challenge indeed! And I think you are just the one to take it on! RFG, good eye there RFG. I had to go back through the photos to see what you were talking about. However guess what, that isn't creeping jenny, it's a sedum in its early spring green. Sedum spurium 'Dragon's Blood' I believe. 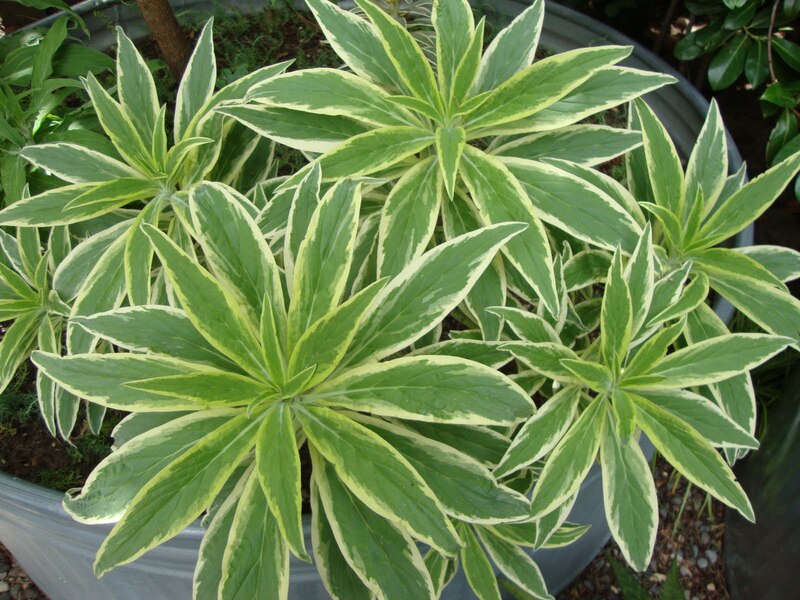 Denise, get the variegated one, you won't regret it! ricki, it is! (was)...Cistus is the source. You need one. 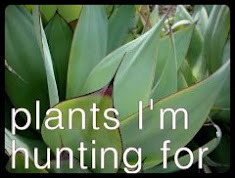 But maybe wait till next spring and get one with a forming bloom spike. They last for months! Laura, both!? Now that's just crazy talk. Megan, but at least yours will live through the winter. Lauren, so did your 'Rocket' over winter and bloom the following year or did you only have it the one year? I was going to say, the one Echium I have, E. tuberculatum died last winter but dropped a lot of viable seed first. It reminds me of a full sun Pulmonaria on steroids. If you want seed, let me know although it's more about the flowers than the foliage with this one.